Low mileage cars – a sensible buy? Has it done thousands of very short journeys? If so, the door locks and hinges will be as worn as a 100,000 mile car, the cylinder bores will be scored from that first unlubricated crank at every cold start, the oil will have been diluted with petrol from repeated starting, the engine will never have warmed up properly and may have been attacked internally by condensation and corrosive pollutants, the steering will be worn from constant low speed manoeuvering and the valve guides, hoses, drive belts, suspension bushes and tyres will all have perished. Has it been stored correctly? A lengthy period in a humid garage, maybe after driving on wet or salty roads, will set up rampant corrosion in hidden cavities, even if the visible surfaces are polished to perfection. Leather, fabric and wood components will suffer from mould and rot under the same conditions. Prolonged periods of disuse cause any machinery to deteriorate and moving parts to seize. Has it been regularly serviced? A car needs its fluids changing every few years even if it hasn’t been used. We prefer to see cars which have covered an average of at least 3,000 miles per annum, and we’re not too worried if it is twice that or more. 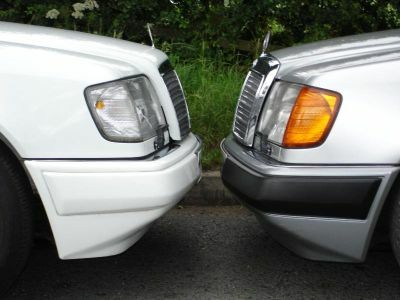 Provided it has been well maintained and sympathetically treated, a Mercedes of our favoured era should last well over 200,000 miles, and will still be reliable and a pleasure to drive. Some of our own personal vehicles have exceeded that figure already and are going very nicely thank you. Regular use is the best way to ensure long life of mechanical devices. When one thinks about it, the only way a car can clock up high mileages is to be in more or less constant use for longish journeys. A Mercedes running at a constant 70mph down a motorway is about as unstressed as it is possible for it to be – and so is the driver! Of course we know that there is a very strong demand for low mileage cars, so we source them whenever we can. We do however look at the whole picture when assessing the cars, and will only buy them where the other factors are in agreement as well.